The full entry form for the 2010 Spotlight Awards Competition. Complete this abbreviated entry form. Fill your entry form and upload your materials online now. 8 AM - 5PM PDT, Mon. - Fri.
Be sure to review LACP's FAQ for more information about the competitions. If you need any further information, send us an e-mail. the best-organized competition we've ever experienced. Thanks for your hard work!" job and altogether the best-organized competition." ▪ A Semi-Annual Update to the Industry's Most Popular Competition of Its Kind. We've been told that a semi-annual competition format is preferred since many communications materials become outdated after six months. We've listened and are proud to announce the creation of the 2010 Spotlight Awards � Encore Edition, a semi-annual touchstone for the best in communications. ▪ Enhanced Results Kits. Now 12+ pages of competition coverage, individual metrics and feedback; a CD packed with resources; and other important supplemental materials. Nothing distinguishes your work and brings recognition to you and your team more than honors from the 2010 Spotlight Awards. The 2010 Spotlight Awards recognizes the outstanding print-, video- and web-based communications materials from the Public Relations and Communications professions during the past twelve months. From Citigroup to General Electric, Abbott to YRC, companies large and small compete against peers of similar size, staff, and means to earn recognition for their organization�s achievements. Here's your chance to earn due recognition for your hard work in communications. As one of the nation's premiere communications materials competition, the 2010 Spotlight Awards provides a platform for communications professionals to demonstrate the value they�re delivering to their organization. Whether you focus on communications for a corporation, non-profit organization, governmental, or educational entity, LACP�s 2010 Spotlight Awards competition is a chance to have the high quality of your work validated by one of the most respected competition forums in the world. The Call for Entries concludes March 19, 2010. (April 2, 2010 with late fee.) So don�t delay; be sure to submit your entry today! � Full-Blown Winners� Kits. Tailored especially to you and presented in a personalized three-ring binder, these kits walk you through the entire judging process and provide you with your individual results. 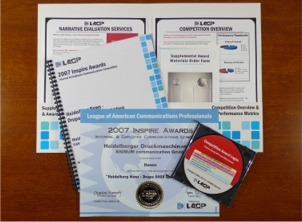 This kit is an excellent addition to any communicator�s portfolio. � Recognition with the News Media. Top-performing honorees are highlighted in LACP�s 2010 Spotlight Awards press announcement, sent via newswire to the top news outlets around the world. The deadline to submit entries for this year's competition is March 11, 2011. 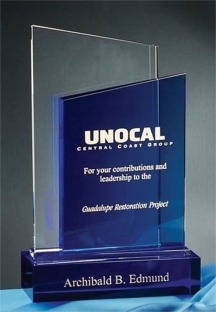 Winners will be announced and awards distributed on April 25, 2011. ∙ Integrated Technology. We streamline a lot of our judging and production processes with custom computer applications solely developed to manage our competitions. Not a lot of other PR organizations are able to match our level of organization and innovation, so we can offer more and get it done faster. ∙ Web-Based Promotion. The majority of our promotion is web-based via our free e-mail newsletter, SPIN. This communications vehicle reaches 30,000 PR pros monthly at 1/10th the cost of conventional mailings. ∙ Focused--Not Superfluous--Activities. Some competitions wrap up with awards banquets in New York City or a charter yacht in Florida. Unless you're looking for an excuse to go on a boondoggle, this doesn't offer much value. We invest instead in promoting our winners to the news media and the world. Many other competitions print out awards and send them in the mail without any indication that considerable thought was put into the decision-making. At LACP, we do things differently--we provide you with extensive metrics that tell you exactly where an entry excels or could use improvement. Plus, you gain extensive data on whom you competed against and how you compare. Sometimes, the only results seen from a competition is an award certificate or two thrown in a manila envelope. That's unacceptable in our minds--that's why we painstakingly build custom Winners' Kits that give you everything imaginable from a competition--statistics, percentiles, narrative commentary, press releases, artwork, and more. A typical kit is 12+ pages long.